Essential Oils help to heal the body, whether through smell (Aromatherapy) – When you inhale, odor molecules travel through the nose and affect the brain through receptor sites. The Lymbic System which is “the emotional brain” is directly connected. It effects parts of the brain that control heart rate, blood pressure, breathing, memory, stress levels, and hormone balance. When you apply essential oils to the skin, they are absorbed into the bloodstream by the pores and hair follicles. Once inside the bloodstream, they disperse to the specific organs and systems of which need their healing properties. They have amazing effects on health! Birch – Eczema, Arthritis, Asthma, Dysentery, Bladder infections, Cholera, Colds, Flu, Headaches, Psoriasis, Toothaches, Viral infections, Sinusitis. Cinnamon Bark – Flu, Rheumatism, Warts, Coughs & Colds, Viral infections, Fungus, Bacteria, Helps regulate blood sugar. Clove Bud – Toothache, Parasites – will kill parasite eggs, Flatulence, Diarrhea, Infections, Acne. Eucalyptus – Sore throats, Coughs, Asthma, Respiratory problems, Diabetes, Fevers, Gall stones, Hemorrhage, Sinusitis, Skin infections, Achy muscles. Frankincense – Sores, Fevers, Coughs, Colds, Stress & Anxiety, Depression, Menstrual cramps. Known for its all-around healing capability. Grapefruit – Kidney & Liver problems, Migraine, Depression, Reduces water retention, Cellulite, House cleaning. Helicrysum – Generates new tissue for healing, Reduces pain, Skin conditions, Circulation, Reduces inflammation, Hearing loss. All-around healer of soft and hard tissue. Lavender – The Universal Oil, Burns, Inflammation, cuts, Eczema, Fainting, Headaches, Migraine, Anxiety & Stress, Infections, PMS, Acne, Colic, Dermatitis & other skin problems, Diarrhea, Epilepsy, Insomnia, Nausea, Anti-venom properties, insect bits. Lemon – Sore throat, Anxiety, Blood Pressure, Cleans kidneys, Cleans blood and thins it slightly, Digestive problems, Gallstones, Cellulite, House cleaning, Antiseptic. Lemongrass – Infections, Headaches, Respiratory problems, Insect repellent, Sore throat, Digestive problems. Lime – Fevers, Sore throat, Headaches, Anxiety, Depression. Orange – Depression, Anxiety, Constipation, Muscular Spasms, Dyspepsia. Oregano – Strong anti-fungal, anti-bacterial, anti-viral, anti-parasite, Bronchitis, Digestive problems, Strong oil – must be diluted before application. Peppermint – Acne, Dermatitis& other skin problems, Toothache, Muscle pain, Circulation, Colds, Clears sinuses from congestion, Cough, Cramps, Nausea, Headache, Anxiety. Rosemary – Helps mental concentration and clarity, Asthma, Baldness, Bronchitis, Liver problems, Diarrhea, Gout, Epilepsy, Digestive problems, Jaundice, Palpitations, Scabies, Whooping cough. Tea Tree – Anti-bacterial, Antiseptic, Anti-fungal, Anti-inflammatory, Skin problems. Beloved Blue – Soothing and cooling to muscles, perfect for massage. Ingredients – Wintergreen, camphor, peppermint, blue tansy, blue chamomile, helichrysum, osmanthus. Brain Enhance – Helps improve brain function, mental concentration, clears brain fog. Ingredients – Peppermint, Basil, Cardamon, Rosemary, Rosewood, Geranium, Lemon, Palmarosa, Ylang Ylang, Bergamot, Chamomile, Jasmine. Ladylike – Helps with menstrual cramps, Hormone Inbalance, PMS. Ingredients – Clary Sage, Fennel, Lavender, Jasmine, Yarrow, Marjoram, Basil. Pain Be Gone – Best blend for pain relief, Helps with inflammation, Healing injuries. Ingredients – Spruce, Black Pepper, Hyssop, Peppermint, Helichrysum. Peaceful Bliss – Helps reduce depression, anxiety, stress, tension. Ingredients – Tangerine, Orange, Ylang Ylang, Patchouli, Blue Tansy. Super Immune – Boosts the immune system to fight off illness. Prevents illness. Best blend of its kind! Anti-bacterial, Anti-viral, Anti-fungal. Feel free to call or stop in and ask questions. 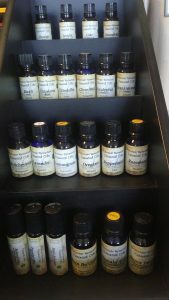 Our prices on oils are very affordable!